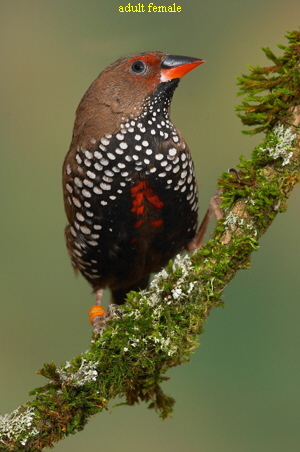 Until recently, the painted firetail (Emblema pictum) was a rare and delicate species found in the aviaries of European aviculturists. 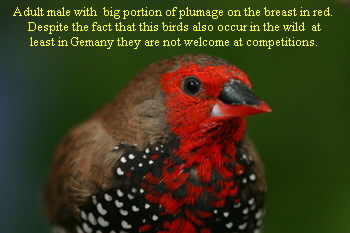 Due to the successful breeding and selection of many diligent finch-lovers, this is no longer the case. Of course there were many frustrations following the Australian export ban, but at the end hard work paid off and nowadays painted firetails are among the most common and popular species. In the wild, these birds inhabit the arid and semi-arid regions of central and central-western Australia. Although the species is extremely well-adapted to live in this dry and harsh environment, they are bound to the very few places where there is enough water. Their main food are seeds of different Spinifex species (Triodia spp.) Their long and slender bills allow them to search in the desert sand for the tiny seeds. Painted firetails are opportunistic breeders and can breed as soon as there is enough food, in their case half-ripe Spinifex seeds. 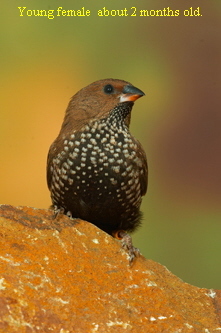 In this respect they behave similarly to the well-known and extremely easy to breed zebra finch (Taeniopygia guttata); however, as we will see later, they also differ in many aspects. 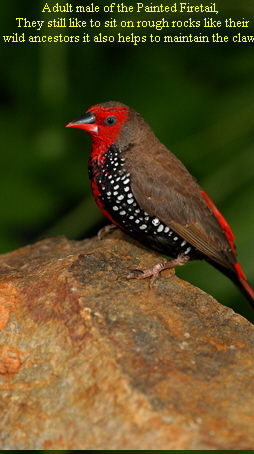 Captive painted firetails still stick to many of the habits known from their wild ancestors. For instance, they still prefer to dig in the dirt for seeds and like to sit on rocks. As aviculturists we always try to consider where the bird lives in the wild. A bird living in the desert will certainly be unhappy if we house it in an aviary which is designed for reed birds and vice versa. As a desert bird, the painted firetail likes open space and sandy places but also thickets where they can build their nests. Painted firetails, particularly fledglings, spend a tremendous amount of their time on the ground searching for food. Hence, it is best to keep them in indoor aviaries or large cages except if you are lucky to live in a place warm enough for keeping these birds in an outdoor aviary. As already mentioned, painted firetails like to sit on rocks (you can use artificial rocks with a built-in heater; they are often found in places where you find reptiles for sale). As a substitute, we can offer thick branches with rough bark. 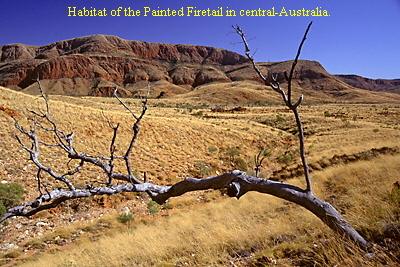 The nest in the wild is usually built in a clump of Spinifex or other dense vegetation near the ground. In captivity, various nest sites may be chosen, often the birds still build in dense vegetation near the ground. Due to selection, many pairs now prefer nest boxes which should not be smaller than 12x12x12cm. Surprisingly, the best place for the nest box is high up in the cage whereas in the aviary medium-high is the preferred spot. Most pairs prefer to nest in a shadowed area - no wonder, in the wild they would be grilled if they put their nest in a sunny place. Therefore, it is wise to place at least one nest box as far away as possible from any light source, or, in case of an outdoor aviary, to look for a shadowed place. As there are nowadays practically all kind of seeds available on the market, feeding the birds is no longer difficult. The best is a seed mixture which contains mainly small millet and grass seeds (it can be obtained by Blattner under the name ‘Astrilde’ (Estrildian)). If you prefer to buy the seeds separately, the small ones like Senegal Manna and Mohair millet are the way to go. Sadly, most of the standard seed mixtures contain only very small amounts of them. Millet spray is always highly welcome in particular the red one. Painted firetails love Millet spray when it is still half-ripe. Further, one can offer all kinds of seeding wild meadow grass, chickweed - depending on the experience of the birds they will readily go for it or hesitate for a while but eventually they will like it. Most pairs won’t raise their offspring without a certain amount of live food. Most of the birds will accept the now widely available frozen live food such as Pinkies, Buffalos and Mealworms. Others desire live insects like small Mealworms and Buffalos. Ant pupas are a favorite of nearly all painted firetails. If the birds hesitate to accept new food items it is often best to mix it with their favorite food and a little bird soil. This is also the method for offerering sprouted seeds consisting of the millet sorts mentioned before mixed with bird soil. During breeding, it is wise to offer the birds all the goodies they like. During the non-breeding season it is best to keep the birds mainly on dry seeds with occasional small amounts of frozen insects and germinated seeds. After all, they live in an arid environment with big seasonal differences in food availability; simulating these circumstances in captivity helps to keep them healthy and synchronize the pairs in their breeding efforts. Sand, cuttle bone, and crushed oyster shell should be available daily, as should crushed baked poultry eggshells and mineralized grit. Often, the birds like to eat small amounts of clay and soil as well. Because some females tend to have problems with egg binding, we start to dust the offered seeds with Nekton MSA two months before the breeding season. So far none of our birds had egg binding the last 12 years. Painted firetails are not that hard to breed and rarely fail raising their young. When nests do fail, is is likely that the breeders didn’t consider the demands of the species or the pair is not getting along. In the latter case, the pair must be split up and paired again with other mates. The best way to get amicable pairs is to always have several pairs and let the birds choose their partners. Such love marriages very rarely fail. They are often the most devoted breeding pairs one can imagine. Now let’s look at the special demands of painted firetails. There should be a suitable nesting place for them which often depends where the birds are coming from. Birds which grew up in large planted aviaries tend to prefer dense scrub and don’t use nest boxes. The opposite is true for birds originating from breeders which keep their birds in cages with nest boxes. Oddly, there is not much difference in the choice of nesting material, nearly all like coconut fibers or small twigs like tiny tips of birch twigs. Feathers and other soft material are used for lining the nest. If offered, some pairs will carry in small pieces of charcoal, a behavior known from the wild but with unknown function. 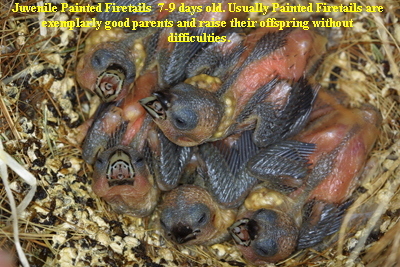 Painted firetails hatch after approximately 14 days in outdoor aviaries. When the weather is a bit colder, it may be one or two days later. The nestlings stay in the nest another 18-22 days until they fledge. Chicks growing up in nest boxes tend to need a bit longer than birds growing up in nests located in dense scrubs. The most likely reason is that the young in the scrub can slowly explore the space around the nest in the safety of the scrub. When it leaves the nest box there is rarely dense vegetation around it where it can start to explore a small fraction of its future world and then go back in the known safe haven of the nest. With nest boxes it is like starting to swim in a big lake not knowing how big and deep it is. 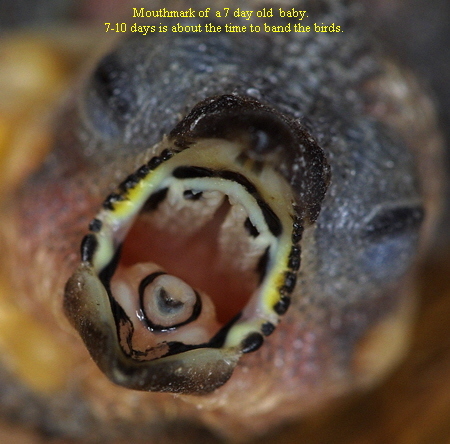 After fledging, the parents will care for the babies for another 10-14 days. 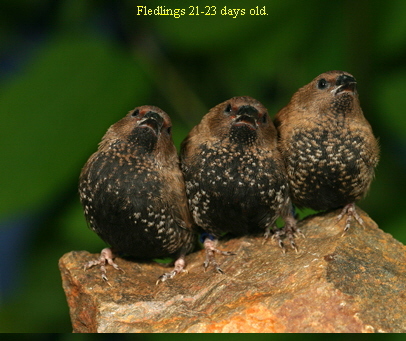 This period is the most critical for the fledglings. Painted firetails usually start a new brood as soon as the chicks fledge and sometimes they forget about their fledglings and/or are only engaged with building a new nest and laying eggs for the new brood. If this is the case, there is not much to do other than to take the whole family and put them in another cage without a nest box, nesting material or stimulating scrub corners. In most cases, the parents will then start feeding their youngsters again and after two weeks the fledglings are on their way to adulthood and no longer depend on their parents. We cannot emphasize enough how beneficial it is to offer the small and soft millet mentioned already at the beginning. First of all, they are easier to handle for the juveniles and second easier to digest. In many cases the fledglings can already be sexed. Young females tend to have a brownish black plumage with smaller and more white dots at the throat than the males but occasionally there will be a young male looking like a young female and the other way round. Molt into adult plumage takes about three months but seems not to be awfully stressful for painted firetails. Usually they don’t get health problems as, for instance, Gouldians or Bluebills. There are of course many different ways to breed painted firetails and some will be more or less successful. If the way you do it works don’t change it - if you have problems try a different approach. We wish you the best luck with the birds and in particular with the avian jewel from central Australia, the painted firetail, surely one of the most beautiful birds one can imagine.